I love a new challenge and this one was a blast. 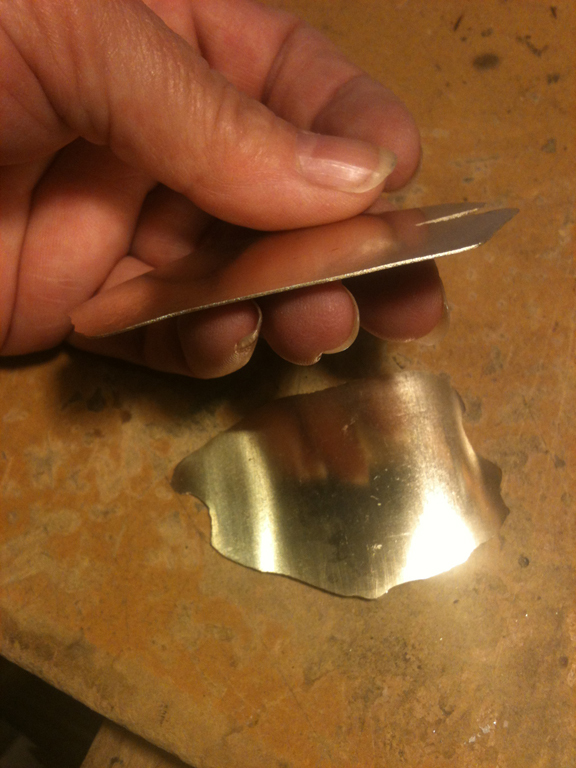 My friend Lauri and I decided to take some old gold jewelry and turn it into sheet. I had a couple of pieces of 14k gold jewelry that I knew I’d never wear again so we studied up, melted it down and rolled away. What started out as a very ugly nugget bracelet and an old wedding ring are now 2 small 23 gauge sheets of gold ready for my creative vision. We learned a lot through the process. There was definitely a learning curve on the adventure as neither of us had ever melted down anything in a crucible, only silver on a charcoal block. We set up a little kiln using firebricks. This would allow us to hold as much heat inside the crucible as possible. I had a brand new crucible (a ceramic dish made to take the heat) so it needed to be prepared ahead of time. The crucible needs a glaze inside to prevent the metal from sticking or being absorbed into the ceramic. We had read online that it could be done in an oven so we assumed that we could do it in the kiln at no more than 500 degrees or so. Bad assumption. We chose a mix of borax and boric acid, neither of which melts at 500 degrees. The powders kept getting harder and harder inside the kiln. No signs of liquid to swirl around and glaze the crucible. We decided to be brave and use a torch (MAPP gas because it was handy). We got it unbelievably hot: so hot that the crucible was glowing orange! I kept expecting it to blow up and kill us at any second, and then lo and behold we saw that the borax and boric acid were melting! Suddenly we had another problem in that our crucible tongs were absolutely the wrong type for the job. We couldn’t swirl the borax mixture around to coat the inside of the crucible. A quick trip to the kitchen and one pasta server later, we had a great little tong setup that made us feel like maybe we weren’t going to drop the whole mess and melt my floor. Sometimes my kitchen is the best supplier of metalsmithing tools. Crucible seasoned, we started experimenting with pieces of the old bracelet. We figured out early on that one torch wasn’t enough so we put 2 torches to the task. Lauri held the torches while I stirred the gold and borax mixture with a graphite rod. Hotter and hotter it all became until the gold melted into a little glowing orange blob. I poured the gold into a graphite ingot mold while Lauri kept the torch on the crucible to prevent oxides from forming. We felt like amazons! There were problems, but we forged ahead (PTP) to the rolling stage. I rolled the ingot into a tiny sheet, but because it wasn’t as homogenous as it should have been it started to develop air bubbles as I rolled. We had a feel for the process now so it was a no-brainer to melt it all again and start over. Besides, it was really fun. Given all the heating, I’m pretty sure that my 14k gold is more like 18k now. This time we added the rest of my ugly bracelet and the wedding ring and melted down the whole shebang in 2 batches. It took a lot of heat to melt down .87 oz of gold! The keys to getting the perfect ingot were to add more borax as we were heating, to stir well with the graphite rod in order to burn off any impurities, and to follow the crucible with the torch all the way through pouring into the mold. Once the ingot was made I started rolling, annealing, rolling, annealing until the sheet was down to 23 gauge, which is where the project is now. I just love my little sheets of gold, and the fact that they are made from old jewelry is wonderful. After we were finished Lauri and I searched our jewelry boxes for more gold to melt down! I have an old herringbone necklace that is in serious danger.